Fresh-Water Fish not of much value - The Angler and his Equipment - Pleasures of the Country in May - Anglers' Fishes - Trout, Pike, Perch, and Carp - Gipsy Anglers - Angling Localities - Gold Fish - The River Scenery of England - The Thames - Thames Anglers - Sea Angling - Various Kinds of Sea-Fish - Proper Kinds of Bait - The Tackle necessary - The Island of Arran - Corry - Goatfell, etc. ALTHOUGH it may be deemed necessary in a work like the present to devote some space to the subject, I do not set much store by the common anglers' fishes, so far, at least, as their food value is concerned ; for although we were to cultivate them to their highest pitch, and by means of artificial spawning multiply them exceedingly, they would never (the salmon, of course, excepted) form an article of any great commercial value in this beef-eating country. In France, where the Church enjoins many fasts and strict sumptuary laws, the people require, in the inland districts especially, to have recourse to the meanest produce of the rivers in order to carry out the injunctions of their priests. The smallest streams are therefore assiduously cultivated in many continental countries ; but the fresh-water fishes of the British Islands have only at present a very slight commercial value, as they are not captured, either individually or in the aggregate, for the purposes of commerce ; but to persons fond of angling they afford sport and healthful recreation, whether they are pursued in the large English or Scottish lakes, or caught in the small rivulets that feed our great salmon streams. Although Britain is possessed of a seabord of 4000 miles, and a large number of fine rivers and lakes, the total number of British fishes is comparatively small (about 250 only), and the varieties which live in the fresh water are therefore very limited ; those that afford snort may be numbered with ease on our ten fingers. Fishers who live in the vicinity of large cities are obliged in consequence to content themselves with the realisation of that old proverb which tells them that small fish are better than no fish at all ; hence there is a race of anglers who are contented to sit all day in a punt on the Thames, happy when evening arrives to find their patience rewarded with a fisher's dozen of stupid gudgeons. But in the north, on the lakes of Cumberland or on the Highland lochs of Scotland, such tame sport would be laughed at. Are there not charr in the Derwent and splendid trout in Loch Awe I and these require to be pursued with a zeal, and involve an amount of labour, not understood by anglers who punt for gudgeon or who haunt the East India Docks for perch, or the angler who only knows the usual run of Thames fish-barbel, roach, dace, and gudgeon. To kill a sixteen-pound salmon on a Welsh or Highland stream is to be named a knight among anglers ; indeed, there are men who never lift a rod except to kill a salmon ; such, however, like the Duke of Roxburghe, are giants among their fellows. For sport there is no fish like the "monarch of the brook," and great anglers will not waste time on any fish less noble. An angler, with a moderate-sized fish of the salmon kind at the end of his line, is not in the enjoyment of a sinecure, although he would not for any kind of reward allow his work to be done by deputy. I have seen a gentleman play a fish for four hours rather than yield his rod to the attendant gillie, who could have landed the fish in half-an-hour's time. It is a thrilling moment to find that, for the first time, one has hooked a salmon, and the event produces a nervousness that certainly does not tend to the speedy landing of the fish. The first idea, naturally enough, is to haul our scaly friend out of the water by sheer force ; but this plan has speedily to be abandoned, for the fish, making an astonished dash, rushes away up stream in fine style, taking out no end of "rope;" then when once it obtains a bite of its bridle away it goes sulking into some rocky hiding-place. In a brief time it comes out again with renewed vigour, determined as it would seem to try your mettle ; and so it dashes about till you become so fatigued as not to care whether you land it or not. It is impossible to say how long an angler may have to "play" a salmon or a large grilse ; but if it sinks itself to the bottom of a deep pool, it may be a business of hours to get it safe into the landing net, if the fish be not altogether lost, as in its exertions to escape it may so chafe the line as to cause it to snap, and thus regain its liberty ; and during the progress of the battle the angler has certainly to wade, ay and be pulled once or twice through the stream, so that he comes in for a thorough drenching, and may, as many have to do, go home after a hard day's work without being rewarded by the capture of a single fish. There is abundance of good salmon-angling to be had at the proper season in the north of Scotland, where there are always a great variety of fishings to let at prices suitable for all pockets; and there is nothing better either for health or recreation than a day on a salmon stream. There are one or two places on Tweed frequented by anglers who take a fishing as a sort of joint-stock company, and who, when they are not angling, talk politics, make poetry, bandy about their polite chaff, and generally " go in," as they say, for any amount of amusement. These societies are of course very select, and not easily accessible to strangers, being of the nature of a club. The plan which every angler ought to adopt on going to a strange water is to place himself under the guidance of some shrewd native of the place, who will show him all the best pools and aid him with his advice as to what flies he ought to use, and give him many useful hints on other points as well. Anglers, however, must divide their attention, for it is quite as interesting (not to speak of convenience) for some men to spend a day on the Thames killing barbel or roach as it is to others to kill a ten-pound salmon on the Tweed or the Spey. It is good sport also to troll for pike in the Lodden or to capture grayling in beautiful Dovedale. And so pleasant has of late years become the sport, that it is now quite a common sight to see a gentle-born lady handling a salmon-rod with much vigour on some of our picturesque Highland or border streams. In fact, angling is a recreation that can be made to suit all classes, from the child with his stick and crooked pin to the gentleman with his well-mounted rod and elaborate tackle, who hies away in his yacht to the fiords of Norway in search of salmon that weigh from twenty to forty pounds, and require half a day to capture. For those, however, who desire to stay at home there is abundant angling all the year round. From NewYear's Day to Christmas there needs be no stoppage of the sport ; even the weather should never stop an enthusiastic angler ; but on very bad days, when it is not possible to go put of doors, there is the study of the fish, and their natural and economic history, which ought to be interesting to all who use the angle, and to the majority of mankind besides. Without pretending to rival the hundred and one guides to angling that now flood the market, I shall take a glance at a few of the more popular of the angler's fishes ; not, however, in any scientific or other order of precedence, but beginning with the trout, seeing that the salmon is discussed in a separate division of this work. Of all our fresh-water fishes, the one that is most plentiful, and the one that is most worthy of notice by anglers, is the trout. It can be fished for with the simplest possible kind of rod in the most tiny stream, or be captured by elaborate apparatus on the great lochs of Scotland. There are so many varieties of it as to suit all tastes ; there are well-flavoured burn trout, not so large as a small herring, and there are lake giants that, when placed in the scales, will pull down a twenty-pound weight. The usual run of river trout, however, is about six or eight ounces in weight ; a pound trout is an excellent reward for the patient angler. Where a fronting stream flows through a rich and fertile district of country, with abundant drainage, the trout are usually well-conditioned and large, and of good flavour ; but when the country through which the stream flows is poor and rocky, with no drains carrying in food to enrich the stream, the fish are, as a matter of course, lanky and flavourless ; they may be numerous, but they will be of small size. It is curious, too, to note the difference of the fish of the same stream : some of the trout taken in Tweed, and in other rivers as well, are sharp in their colour, have fine fat plump thick shoulders, great depth of belly, and beautiful pink flesh of excellent flavour. The flavour of trout is of course dependent on the quality and abundance of its food ; those are best which exist on ground-feeding, living upon worms and such fresh-water crustaceans as are within reach. Fly-taking fish-those that indulge in the feed of ephemerae that takes place a few times every day-are comparatively poor in flesh and weak in flavour. As to where fishers should resort, must be left to themselves. I was once beguiled out to the Dipple, but it is a hungry sort of river, where the trout were on the average only about three ounces, and scarce enough ; although I must say that for a few minutes, when "the feed" was on the water, there was an enormous display of fish, but they preferred to remain in their native stream, a tributary of the Clyde I think. The mountain streams and lochs of Scotland, or the placid and picturesque lakes of Cumberland and Westmoreland, are the paradise of anglers. For trout-fishing I would name Scotland as being before all other countries. "What," it has been asked, " is a Scottish stream without its trout ? " Doubtless, if a river has no trout it is without one of its greatest charms, and it is pleasant to record that, except in the neighbourhood of very large seats of population, trout are still plentiful in Scotland. It is true the railway, and other modes of conveyance, have carried of late years a perfect army of anglers into its most picturesque nooks and corners, and therefore fish are not so plentiful as they were fifty years since, in the old coaching days, when it was possible to fill a washing-tub in the space of half-an-hour with lovely half-pound trout from a few pools on a burn near Moffat. But there are still plenty of trout ; indeed there are noted Scotch fishers who can fill baskets from streams near large cities that have been too much fished. The place to try an angler is a fine Border stream or a grand Highland loch ; but I shall not presume to lay down minute directions as to how to angle, for an angler, like a poet, must be born, he can scarcely be bred, and no amount of book lore can confer upon a man the magic power of luring the wary trout from its crystalline home. The best anglers, and fish-poachers, are gipsies. A gipsy will raise fish when no other human being can move them. If encamped near a stream, a gipsy baud are sure to have fish as a portion of their daily food ; and how beautifully they can broil a trout or boil a grilse those only who have dined with them can say. Your gipsy is a rare good fisher, and with half a rod can rob a river of a few dozens of trout in a very brief space of time, and he can do so while men with elaborate "fishing machines," fitted up with costly tackle, continue to flog the water without obtaining more than a questionable nibble, just as if the fish knew that they were greenhorns, and took pleasure in chaffing them. Mr. Cheek, who wrote a capital book for the guidance of those I may call Thames anglers, says that the best way to learn is to see other anglers at work-which is better than all the written instructions that can be given, one hour's practical information going farther than a folio volume of written-advice. It is all in vain for men to fancy that a suit of new Tweeds, a fair acquaintance with Stoddart or Stewart, and a large amount of angling "slang," will make them fishers. There is more than that required. Besides the natural taste, there is wanted a large measure of patience and skill ; and the proper place to acquire these best virtues of the angler is among the brawling hill streams of Scotland, or on the expansive bosom of some Cumberland lake, while trying for a few delicious charr. A congregation of fish brought together by means of a scatter of food and an angler's taking advantage of the piscine convention over its diet of worms, is no more angling than a battue is sport. An American that I have heard of has a fish-manufactory in Connecticut, where he can shovel the animals out by the hundred ; but then he does not go in for sport; his idea-a thoroughly American one-is money ! But despite this exceedingly commercial idea, there are a few anglers in America, and as water and game fishes abound, there is plenty of sport. In North America are to be found both the true salmon and the brook trout ; and as a great number of the American fishes visit the fresh and salt water alternately, they, by reason of their strength and size, afford excellent employment either to the river or sea angler. One of the best American fishes is called the Mackinaw salmon. and imparts to his frame a strength and elasticity known only to such as are familiar with country scenes and pure air. May and the Mayfly are held to inaugurate the angler's year; for although a few of the keenest sportsmen keep on angling all the year round, most of them lay down their rod about the end of October, and do not think of again resuming it till they can smell the sweet fragrance of the advancing summer. Although few of our busy men of law or commerce are able to forestall the regular holiday period of August and September, yet a few do manage a run to the country at the charming time of May, when the days are not too hot for enjoyment nor too short for country industry. In August and September the landscape is preparing for the sleep of winter, whilst in May it is being robed by nature for the fetes of summer, and, despite the sneers of some poets and naturalists, is new and charming in the highest degree. Town living people should visit the country in May, and see and feel its industry, pastoral and simple as it is, and at the same time view the charms of its scenery in all its vivid freshness and fragrance. Some anglers delight in pike-catching, others try for perch ; but give me the trout, of which there is a large variety, and all worth catching. In Loch Awe, for instance, there is the great lake trout, which, combined with the beauty of the scenery, has sufficed to draw to that neighbourhood some of our best anglers. The trout of Loch Awe, as is well known, are very ferocious, hence their scientific name of Salmo ferox. It attains to great dimensions ; individuals weighing twenty pounds have been often captured ; but its flavour is indifferent and the flesh is coarse, and not prepossessing in colour. This kind of trout is found in nearly all the large and deep lochs of Scotland. It was discovered scientifically about the end of last century by a Glasgow merchant, who was fond of sending samples of it to his friends in proof of his prowess as an angler. The usual way of taking the great lake trout is to engage a boat to fish from, which must be rowed gently through the water. The best bait is a small trout, with at least half-a-dozen strong hooks projecting from it, and the tackle requires to be prodigiously strong, as the fish is a most powerful one, although not quite so active as some others of the trout kind, but it roves about in the deeper waters, enacting the part of bully and cannibal to all lesser creatures, and driving before it even the hungry pike. Persons residing near the great lochs capture these large trout by setting night lines for them. As has been already mentioned, they are exceedingly voracious, and have been known to be dragged for long distances, and even after losing hold of the bait to seize it again with much eagerness, and so have been finally captured. These great lake trout are also to be found in other countries. In Lochleven, at Kinross, twenty-two miles from Edinburgh, there will be found localised that beautiful trout which is peculiar to this one loch, and which I have already referred to as one of the mysterious fishes of Scotland. This fish -although its quality is said to have been degenerated by the drainage of the lake in 1830, at which period it was reduced by draining to a third of its former dimensions-is of considerable commercial value ; it cannot be bought in Edinburgh or London except at a fancy price ; and if it was properly cultivated might yield a large revenue. I have not been able to obtain recent statistics of " the take " of Lochleven trout, but in former years, during the seven months of the fishing season, it used to range from fifteen thousand to twenty thousand pounds weight, and at the time referred to all trout under three-quarters of a pound in weight were thrown back into the water by order of the lessee. Eighty-five dozen of these fine trout have been known to be taken at a single haul, while from twenty to thirty dozen used to be a very common take. As to perch, they used to be caught in thousands. Little has or can be said about Lochleven trout, except that they are a specialty. Some learned people (but I take leave to differ from them) consider the Lochleven fish to be identical with Salmo fario, but never in any of my piscatorial wanderings have I found its equal in colour, flavour, or shape. It has been compared with the Fario Lemanus of the Lake of Geneva, and having handled both fishes, I must allow that there is very little difference between them ; but still there are differences. Netting is not now allowed on the loch, but there is a large fleet of boats, which can be hired at Kinross for an hour or two's fishing on Lochleven. I need not go over all the varieties of fresh-water trout seriatim, for their name is legion, and every book on angling contains lists of those peculiar to districts. If anglers' fishes ever become valuable as food, it will be by the cultivation of our great lochs. With such a vast expanse of water as is contained in some of these lakes, and having ample river accommodation at hand for spawning purposes, there could be no doubt that artificial breeding, if properly gone about, would be successful. 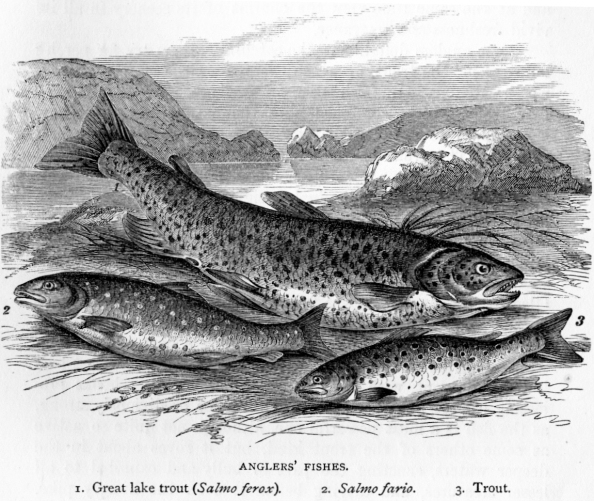 The Lochleven trout is already of great money value commercially, and could be systematically cultivated so as to become a considerable source of revenue to the proprietor of the lake and amusement to the angler ; an experimental attempt at cultivation took place some years ago, but no regular plan of breeding these fish has yet been organised. pounds a year when well supplied with food. The appetite of this fish is very great, and, from its being so fierce, it has been called the pirate of the rivers. It is not easily satisfied with food, and numerous extraordinary stories of the pike's powers of eating and digesting have been from time to time related. I remember, when at school at Haddington (seventeen miles from Edinburgh), of seeing a pike that inhabited a hole in the "Lang Cram" (a part of the river Tyne), which was nearly triangular in shape, supposed to be the exact pattern of its hiding-place, and which devoured every kind of fish or animal that came in its way. It was hooked several times, but always managed to escape, and must have weighed at least twenty-five pounds. Upon one occasion it was hooked by a little boy, who fished for it with a mouse, when it rewarded him for his cleverness by dragging him into the water ; and had help not been at hand the boy would assuredly have been drowned, as the water at that particular spot was deep. As to the voracity of this fish many particulars have been given. Mr. Jesse, in one of his works, says that a pike of the weight of five pounds has been known to eat a hundred gudgeon in three weeks ; and I have myself seen them killed in the neighbourhood of a shoal of parr, and, notwithstanding their rapidity of digestion, I have seen four or five fish taken out of the stomach of each. Mr. Stoddart, one of our chief angling authorities, has calculated the pike to be amongst the most deadly enemies of the infant salmon. He tells us that the pike of the Teviot, a tributary of the Tweed, are very fond of eating young smolts, and says that, in a stretch of water ten miles long, where there is good feeding, there will be at least a thousand pike, and that these during a period of sixty days will consume about a quarter of a million of young salmon ! One would almost suppose that some of the stories about the voracity of pike had been invented ; if only half of them be true, this fish has certainly well earned its title of shark of the fresh water. There is, for instance, the well-known tale of the poor mule, which a pike was seen to take by the nose and pull into the water ; but it is more likely I think that the mule pulled out the pike. Pennant, however, relates a story of a pike that is known to be true. On the Duke of Sutherland's Canal at Trentham, a pike seized the head of a swan that was feeding under water, and gorged as much of it as killed both. A servant, perceiving the swan with its head below the surface for a longer time than usual, went to see what was wrong, and found both swan and pike dead. A large pike, if it has the chance, will think nothing of biting its captor ; there are several authentic instances of this having been done. The pike is a long-lived fish, grows to a large size, and attains a prodigious weight. There is a narrative extant about one that was said to be two centuries and a half old, which weighed three hundred and fifty pounds, and was seventeen feet long. There is abundant evidence of the size of pike : individuals have been captured in Scotland, so we are told in the Scots Magazine, that weighed seventy-nine pounds. In the London newspapers of 1765 an account is given of the draining of a pool, twenty-seven feet deep, at the Lilishall Limeworks, near Newport, which had not been fished for many years, and from which a gigantic pike was taken that weighed one hundred and seventy pounds, being heavier than a man of twelve stone ! I have seen scores of pike which weighed upwards of half a stone, and a good many double that weight, but the weight is thought now to be on the descending ratio, the giants of the tribe having been apparently all captured. Formerly there used to be great hauls of this fish taken out of the water. Whether or not a pike be good for food depends greatly on where it has been fed, what it has eaten, and how it has been cooked. In fact, as I have already endeavoured to show, the animals of the water are in respect of food not unlike those of the land-their flavour is largely dependent on their feeding ; and pike that have been luxuriating on Lochleven trout, or feeding daintily for a few months on young salmon, cannot be very bad fare. Beautiful, yet in mournful durance bound !" Gold-fish ought not to be purchased except from some very respectable dealer. I have known repeated cases where the whole of the fish bought have died within an hour or two of being taken home. These golden carp, which are reared for sale, are usually spawned and bred in warmish water, and they ought in consequence to be acclimatised or "tempered" by the dealer before they are parted with. Parties buying ought to be particular as to this, and ascertain if the fish they have bought have been tempered. country gentlemen have even larger sheets than twelve acres, I recommend this plan of stocking them with carp to their attention. There is only the expense of construction to look to, as an under-keeper or gardener could do all that was necessary in looking after the fish. A gentleman having a large estate in Saxony, on which were situated no less than twenty ponds, some of them as large as twenty-seven acres, found that his r, stock of fish added greatly to his income. Some of the carp weighed fifty pounds each, and upon the occasion of draining one of his ponds, a supply of fish weighing five thousand pounds was taken out ; and for good carp it would be no exaggeration to say that sixpence per pound weight could easily be obtained, which, for a quantity like that of this Saxon gentleman, would amount to a sum of £125 sterling. Now, I have the authority of an eminent fish-salesman for stating that ten times the quantity here indicated could be disposed of among the Jews and Catholics of London in a week, and, could a regular supply be obtained, an unlimited quantity might be sold. As now, fair river, come to me. As thy deep waters are now flowing." And pike, the tyrants of the watery plains." Considering that all its best fishing points are accessible to an immense population, many of whom are afflicted with a mania for angling, it is quite wonderful that there is a single fish of any description left in it ; and yet there are several bands of honest anglers who can fill occasional big baskets. I may be allowed just to run over a few Thames localities, and note what fish may be taken from them. Above Teddington at different places an occasional trout may be pulled out, but, although the finest trout in the world may be got in the Thames, they are, unfortunately, so scarce in the meantime, that it is hardly worth while to lose one's time in the all but vain endeavour to lure them from their home. Pike fishing or trolling will reward the Thames angler better than trouting. There are famous pike to be taken every here and there - in the deep pools and at the weirs : and, as the pike is voracious, a moderately good angler, with proper bait, is likely to have some sport with this fish. But the specialty of the Thames, so far at least as most anglers are concerned, is the quantity of fish of the carp kind which it contains, as also perch. This latter fish may be taken with great certainty about Maidenhead, Cookham, Pangbourne, VVaIton, Labham, and Wallingford Road ; and a kindred fish, the pope, in great plenty, may be sought for in the same localities. Then the bearded barbel is found in greater plenty in the Thames than anywhere else, and, as it is a fish of some size and of much courage, it affords great sport to the angler. The best way to take the barbel is with the " Ledger," and the best places for this kind of fishing are the deeps at Kingston Bridge, Sunbury Lock, Halliford, Chertsey Weir, and in the deeps at Bray, where many a time and oft have good hauls of barbel been taken. The best times for the capture of this fish are late in the afternoon or very early in the morning. Chub are also plentiful in the Thames ; and Mr. Arthur Smith, who wrote a guide to Thames anglers, specially recommended the island above Goring for chub, also Marlow and the large island below Henley Bridge. This fish can be taken with the fly, and gives tolerable sport. The roach is a fish that abounds in all parts of the Thames, especially between Windsor and Richmond ; and in the proper season - September and October-it will be found in Teddington Weir, Sunbury, Blackwater, Walton Bridge, Shepperton Lock, the Stank Pitch at Chertsey, and near Maidenhead, Marlow, and Henley Bridges. At Teddington I may state that the dace is abundant, and there is plenty of little fish of various kinds that can be had as bait at most of the places we have named. 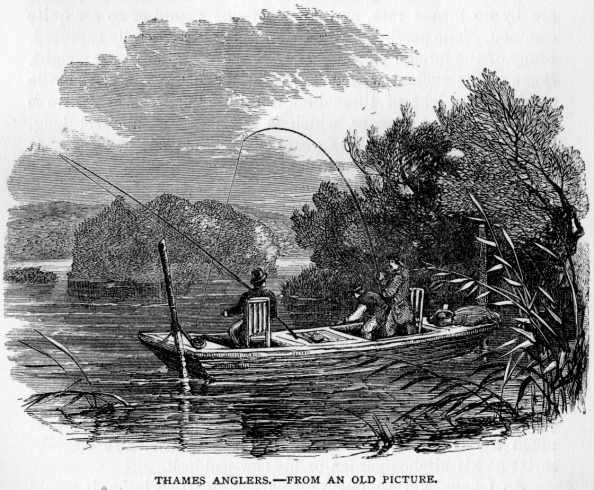 In fact, in the Thames there is a superabundance of sport of its kind, and plenty of accommodation for anglers, with wise "professionals " to teach them the art ; and although the best sport that can be enjoyed on this lovely stream is greatly different from the trout-fishing of Wales or Scotland, it is good in its degree, and tends to health and high spirits, and an anxiety to excel in his craft, as one can easily see who ventures by the side of the water about Kew and Richmond. I come now to the perch, a well-known because common fish, about which a great deal has been written, and which is easily taken by the angler. There are a great number of species of this fish, from the common perch of our own canals and lochs to the "lates" of the Nile, or the beautiful golden-tailed mesoprion, which swims in the seas of Japan and India, and flashes out brilliant rays of colour. The perch was assiduously cultivated in ancient Italy, in the days when pisciculture was an adjunct of gastronomy, and was thought to equal the mullet in flavour. In Britain, the fish, left to its natural growth and no care being taken to flavour it artificially, is surpassed for table purposes by the salmon and the trout ; but perch being abundant afford plenty of good fishing. The perch usually congregate in small shoals, and delight in streams, or water with a clear bottom and with overhanging foliage to shelter them from the overpowering heat of summer. These fish do not attain any considerable weight, the one recorded as being taken in the Serpentine, in Hyde Park, which weighed nine pounds, being still the largest on record. Perch of three and four pounds are by no means rare, and those of one pound or so are quite common. The perch is a stupid kind of fish, and easily captured. Many of the foreign varieties of perch attain an immense weight. Some of the ancient writers tell us that the " lates" of the Nile attained a weight of three hundred pounds ; and then there is the vacti of the Ganges, which is often caught five feet long. The perch, after it is three years old, spawns about May. It may be described as rather a hardy fish, as we know it will live a long time out of water, and can be kept alive among wet moss, so that it may be easily transferred from pond to pond. Its hardy nature accounts for its being found in so many northern lochs and rivers, as in the olden times of slow conveyances it must have taken a long time to send the fish to the great distances we know it must have been carried to. On the Continent, living perch are a feature of nearly all the fishmarkets. The fish, packed in moss and occasionally sprinkled with water, are carried from the country to the cities, and if not sold are taken home and replaced in the ponds. This particular fish, which is very prolific, might be " cultivated " to any extent. Fishponds, although not now common, used to be at one time as much a food-giving portion of a country gentleman's commissariat as his kitchen-garden or his cow-paddock. As I have said so much about the Scottish lochs, it would be but fair to say a few words about those of England ; but in good honest truth it would be superfluous to descant at the present day on the beauties of Windermere, or the general lake scenery of Cumberland and Westmoreland: it has been described by hundreds of tourists, and its praises have been sung by its own poets-the lake poets. It is with its fish that we have business, and honesty compels us to give the charr a bad character. It is not by any means a game fish, so far as sport is concerned ; nor is it great in size or rich in flavour. But potted charr is a rare breakfast delicacy. This fish, which is said by Agassiz to be identical with the ombre chevalier of Switzerland, is rarely found to weigh more than a pound ; specimens are sometimes taken exceeding that weight, but they are scarce. The charr is found to be pretty general in its distribution, and is found in many of the Scottish lochs. It spawns about the end of the year, some of the varieties depositing their eggs in the shallow parts of the lake, while others proceed a short way up some of the tributary streams. In November great shoals of charr may be seen in the rivers Rothay and Brathay, particularly the latter, with the view of spawning. The charr, we are told by Yarrell, afford but scant amusement to the angler, and are always to be found in the deepest parts of the water in the lochs which they inhabit. "The best way to capture them is to trail a very long line after a boat, using a minnow for a bait, with a large bullet of lead two or three feet above the bait to sink it deep in the water ; by this mode a few charr may be taken in the beginning of summer, at which period they are in the height of perfection both in colour and flavour." "Well then, what sport does the sea afford?" will most likely be the first question put by those who are unacquainted with sea-angling. I answer, Anything and everything in the shape of fish or sea-monster, from a sprat to a whale. This is literally true. It is not an unfrequent occurrence for tourists in Orkney, or other places in Scotland, to assist at a whale battue; and some of my readers may remember a very graphic description of an Orcadian whale-hunt, given in Blackwood's Magazine, by the late Professor Aytoun, who was Sheriff and Admiral of Orkney. The kind of sea-fish, however, that are most frequently taken by the angler, both on the coasts of England and Scotland, are the whiting, the common cod, the beautiful poor or power cod, and the mackerel ; there is also the abundant coal-fish, or sea-salmon as I call it, from its handsome shape. This fish is taken in amazing quantities, and in all its stages of growth. It is known by various names, such as sillock, piltock, cudden, poddly, etc. ; indeed most of our fishes have different names in different localities ; but I shall keep to the proper name so as to avoid mistakes. The merest children are able, by means of the roughest machinery, to catch any quantity of young coal-fish ; they can be taken in our harbours, and at the sea-end of our piers and landing -places. The whiting is also very plentiful, so far as angling is concerned, as indeed are most of the Gadidae. It feeds voraciously, and will seize upon anything in the shape of bait ; several full-grown pilchards have been more than once taken from the stomach of a four-pound fish. Whiting can be caught at all periods of the year, but it is of course most plentiful in the breeding season, when it approaches the shores for the purpose of depositing its spawn-that is in January and February. The common cod-fish is found on all parts of our coast, and the sea-anglers, if they hit on a good locality-and this can be rendered a certainty-are sure to make a very heavy basket. The pollack, or, as it is called in Scotland, lythe, also affords capital sport ; and the mackerel-herring and conger-eel can be captured in considerable quantities. I can strongly recommend lythe-fishing to gentlemen who are blases of salmon or pike, or who do not find excitement even among the birds of lone St. Kilda. Then, as will afterwards be described, there is the extensive family of the flat fish, embracing brill, plaice, flounders, soles, and turbot. The latter is quite a classic fish, and has long been an object of worship among gastronomists ; it has been known to attain an enormous size. Upon one occasion an individual, which measured six feet across, and weighed one hundred and ninety pounds, was caught near Whitby. The usual mode of capturing flat fish is by means of the trawl-net, but many varieties of them may be caught with a hand-line. A day's sea-angling will be chequered by many little adventures. There are various minor monsters of the deep that vary the monotony of the day by occasionally devouring the bait. A tadpole-fish, better known as the sea-devil or " the angler," may be hooked, or the fisher may have a visit from a hammer-headed shark or a pile-fish, which adds greatly to the excitement ; and if " the dogs" should be at all plentiful, it is a chance if a single fish be got out of the sea in its integrity. So voracious and active are this species of the Squalidae, that I have often enough pulled a mere skeleton into the boat, instead of a plump cod of ten or twelve pounds weight. I shall now say a few words about the machinery of capture. The tackle in use for handline sea-fishing is much the same everywhere, and that which I describe will suit almost any locality. It consists of a frame of four pieces of wood-work about a foot and a half in length, fastened together in the shape of such a machine as ladies use for certain worsted work. Round this is wound a thin cord, generally tanned, of from ten to twenty fathoms in length. To the extreme end of this line is attached a leaden sinker, the weight of which varies according as the current of the tide is slow or rapid. 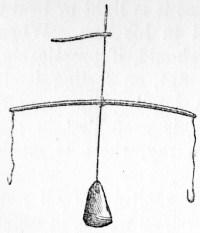 About two feet above the sinker is a cross piece of whalebone or iron, to the extremities of which the strings on which the hooks are dressed are attached. Sometimes a third hook is affixed to an outrigger, about two feet above the other hooks. The length of the cords to which the lower hooks are attached should be such as to allow them to hang about six inches higher than the bottom of the sinker. In some parts of the Western Highlands a rod consisting of thin fir is used, but from the length of line required it is rather a clumsy instrument, as after the fish has been struck the rod has to be laid down in the boat, and the line to be hauled in by hand. As to bait it is quite impossible to lay down any strict rule. The bait which is the favourite in one bay or bank is scouted by the fish of other localities. At times almost anything will do : numbers of mackerel have been taken with a little bit of red cloth attached to the hook ; on certain occasions the fish are so hungry that they will swallow the naked iron On the English coasts, and among the Western Islands of Scotland, the most deadly bait that is used is boiled limpets, which require to be partially chewed by the fisher before placing them on the hooks; in other places mussels are the favourites, and in others the worms procured among the mud of the shore. The limpet has this one advantage, that it is easily fixed on the hook, and keeps its hold tenaciously. A very excellent bait for the larger kinds of fish is the soft parts of the body of small crabs, which are gathered for that purpose at low tide under the stones; a good place for procuring them is a mussel-bed. The best time for fishing is immediately before ebb or flow. The hooks being baited, the line is run over the side of the boat until the lead touches the bottom, when it is drawn up a little, so as to keep the baits out of reach of the crabs who gnaw and destroy both bait and tackle. The line is held firmly and lightly outside the boat, the other hand, inside the boat, also having a grip of the line. The moment a fish is felt to strike, the line is jerked down by the hand inside, thus bringing it sharply across the gunwale and fixing the hook. A little experience will soon enable the angler to determine the weight of the fish, and according as it is light or heavy must he quickly or slowly haul in his line. When the fish reaches the surface, he should, if practicable, seize it with his hand, as it is apt, on feeling itself out of water, to wriggle off. 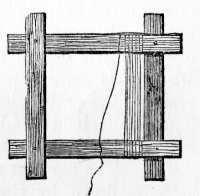 A landing-clip or gaff, such as is used in salmon-fishing, is useful, as, in the event of hooking a conger or a ray, there is much difficulty, and even some danger. In fishing for lythe - the most exciting of all sea angling-a very strong cord is used, on which, in order to prevent the fouling of the line, one or two stout swivels are attached. The hooks also cannot be too strong ; those used for cod or ling fishing are very suitable. The baits in general use are the body of a small eel, about half a foot in length, skinned and tied to the shaft ; or a strip of red cloth, or a red or white feather similarly attached. A piece of lead is fixed on the line at a short distance above the hook. The boat must be rowed or sailed at a moderate rate, and from five or ten fathoms of the line allowed to trail behind. The boat end of the line should be turned once or twice round the arm, and held tightly in the hand ; if the line were fastened to the boat, there is every chance that a large lythe - and they are frequently caught upwards of thirty pounds weight-would snap the tackle. The fish, when hooked, gives considerable play, and rather strongly objects to being lifted into the boat. The clip or gaff is in this case always necessary. In fishing for lythe, mackerel and dogfish are not unfrequently caught. The best place for prosecuting this sport is in the neighbourhood of a rocky shore ; and the best times of the day are the early morning and evening. This fish will also take readily during any period of a dull but not gloomy day. The most amusing kind of sea-angling is fly-fishing for small lythe and saithe (coal-fish). The tackle is exceedingly simple: a rod consisting of a pliant branch about eight feet in length ; a line of light cord of the same length, and a little hook roughly busked with a small white, red, or black feather. The fly is dragged on the surface as the boat is rowed along, and the moment the fish is struck it is swung into the boat. The fry of the lythe and saithe may also be fished for from rocks and pier-heads, using the same tackle. A very ingenious plan for securing a number of these little fish is carried on in the Firth of Clyde and elsewhere. A boat similar in shape to a salmoncoble, with a crew of two-one to row and one to fish-goes out along the shore in the evening, when the sea is perfectly calm or nearly so. The fisher has charge of half-a-dozen rods or more, similar to the one already mentioned. These rods project across the square stern of the boat, and their near ends are inserted into the interstices of a seat of wattled boughs, on which the fisher sits, not steadily, but bumping gently up and down, communicating a trembling motion to the flies. The course of the coble is always close in shore, and, if the fish are taking well, the same ground may be fished over many times during the course of the evening. As to set-line-fishing, it can only be practised in places where the tide recedes to a considerable distance. The cord used is of no defined length, and at certain distances along its entire extent are affixed corks to prevent the hooks sinking in the sand or mud. The shore-end is generally anchored to a stone, and the further end fastened to the top of a stout staff firmly fixed in the beach, and generally attached also to a stone to prevent it drifting ashore in the event of being loosened from its socket. From the staff almost to the shore, hooks are tied along the line at distances of a yard. The hooks are baited at low tide, and on the return of next low tide the line is examined. 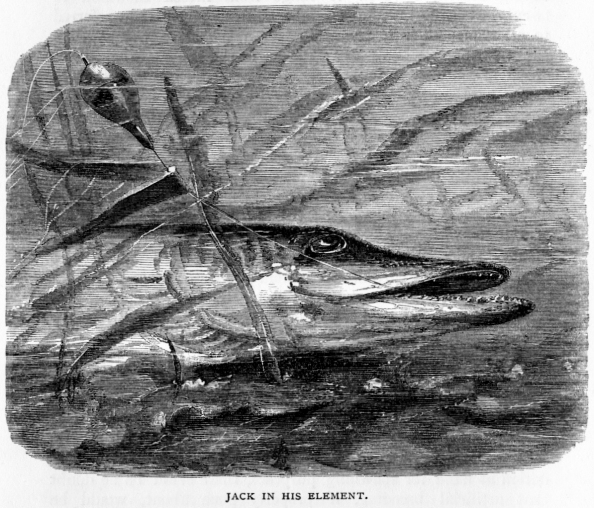 This is neither a satisfactory nor sure method of fishing, as many of the fish wriggle themselves free, and clear the hook of the bait, and many, after being caught, fall a prey to dogfish, etc., so that the disappointed fisher, on examining his line, too often finds a row of baitless hooks, alternating with the half-devoured bodies of haddocks, flounders, saithe, and other shore fish. I may just name another mode of obtaining sport, which is by spearing flat fish, such as flounders, dab, plaice, etc. No rule can be laid down on this method of fishing. 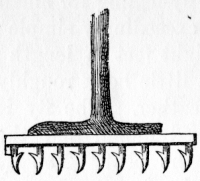 It has been carried on successfully by means of a common pitchfork, but some gentlemen go the length of having fine spears made for the purpose, very long and with very sharp prongs ; others, again, use a three-pronged farm-yard "graip," which has been known to do as much real work as more elaborate utensils specially contrived for the purpose. The simplest directions I can give to those who try this style of fishing are just to spear all the fish they can see, but the general plan is to stab in the dark with the kind of instrument delineated above. At the mouths of most of the large English rivers there is usually abundance of all the minor kinds of flat fish. Lobsters and crabs can be taken at certain rocky places of the coast; mussels can be picked from the rocks, and cockles can be dug for in the sand. Shrimps can also be taken, and various other wonders of the sea and its shores may be picked up. After a storm a great number of curious fishes and shells may be gathered, and some of these are very valuable as specimens of natural history. The apparatus for capturing lobsters and crabs is like a cage, and is generally made of wicker work, with an aperture at the top or the side for the animal to enter by ; it can be baited with any sort of garbage that is at hand. Having been so baited, the lobster-pot is sunk into the water, and left for a season, till, tempted by the mess within, the game enters and is caged. Those who would induce crabs to enter their pots must set them with fresh bait; lobsters, on the other hand, will look at nothing but garbage. Very frequently rockcod, saithe, and other fish, are found to have entered the pots, intent both on foul and fresh food. Shell-fish for bait can be taken by means of a wooden box or old wicker basket sunk near a rocky place, and filled with garbage of some kind ; the whelks and small crabs are sure to patronise the mess extensively, and can thus be obtained at convenience. It is impossible to tell in the limits of a brief chapter one half of the fishing wonders that can be accomplished during a sojourn at the sea-side. A visit to some quaint old fishing town, on the recurrence of " the year's vacation sabbath," as some of our poets now call the annual month's holiday, might be made greatly productive of real knowledge ; there are ten thousand wonders of the shore which can be studied besides those laid down in books. As will be noted, I have avoided as much as possible the naming of localities, preferring to state the general practice. In all seaside towns and fishing villages there are usually three or four old fishermen who will be glad to do little favours for the curious in fish lore-to hire out boats, give the use of tackle, and point out good localities in which to fish. For such as have a few weeks at their disposal, I would suggest the western sea-lochs of Scotland as affording superb sport in all the varieties of sea-angling. Fish of all kinds, great and small, are to be found in tolerable quantity, and there is likewise the still greater inducement of fine scenery, cheap lodgings, and moderate living expenses. But the entire change of scene is the grand medicine ; nothing would do an exhausted London or Manchester man more good than a month on Lochfyne, where he could not only angle in the great water for amusement, but also watch the commercial fishers, and enjoy the finely-flavoured herring of that loch as a portion of his daily food. 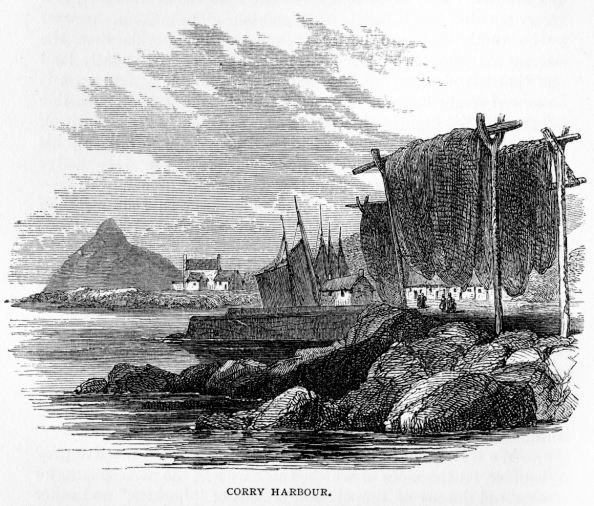 If persons in search of sea-angling wish to combine the enjoyment of picturesque scenery with their pleasant labours on the water, they cannot do better than select the rural village of Corry, on the Island of Arran, as a centre from which to conduct their operations. Our angler, having arrived at Glasgow, can go down the Clyde by steamboat direct to Arran. There is another and a quicker way - viz. by railway to Ardrossan and steamboat to Brodick, but most strangers prefer the river ; and let me say here, without fear of contradiction, there is no pleasure river equal to the Clyde, especially as regards accessibility. The steamers from Glasgow peer at stated intervals into every nook and cranny of the water, and, on the Saturdays especially, deposit perfect armies of people at various towns and villages below Greenock, who are thus enabled to pass the Sunday in the bright open air by the clear waters of this great stream. Any kind of lodging is put up with for the sake of being " down the water ;" and all sorts of people-merchants even of high degree, and " Glasgow -bodies " of lower social standing-are contented, chiefly no doubt at the instigation of their better halves, to sojourn in places that when at home they would think quite unsuitable for even the Matties of their households. The banks of the Clyde have become wonderfully populous within the last twenty-five years-villages have expanded into towns, hamlets have grown into villages, and single cottages into hamlets. Now the railway to Greenock is insufficient as a daily travelling aid to persons whose half-hours are of large commercial value ; and as a consequence, a new line of rails has been constructed to come upon the water at Wemyss Bay, about twelve miles below Greenock. To your thorough business man time is money, and if lie is alternately able to leave his place of business and his place of pleasure half-an-hour later each way, he is all the better pleased with both. To speculators in want of an idea I would say : Rush to the Clyde, and buy up every inch of land that can be had within a mile of the water, build upon it, and from the half million of human beings who tenant Glasgow and the surrounding towns I will engage to find two competing occupants for every house that can be put up. Building has progressed even in Arran, and this too despite the late Duke of Hamilton's dislike to strangers, so that there is now a population on the island of about 7000. A friend of mine says that such an important entity as a duke has no right to do as he likes with his own, and consequently that Arran ought to be built upon, and blackcocks and other game birds be left to take their chance. Even with such limited accommodation as can be now obtained, Arran is a delightful summer residence ; were it to be generally built upon, it would realise from ground-rents alone an annual fortune to his Grace the Duke of Hamilton, who owns the greater part of it, and he might have capital shooting into the bargain. Arran, I may state to all who are ignorant of the fact, is a very paradise for geologists ; and amateur globe-makers-persons 'who think they are better at constructing worlds than the Great Architect who preceded them all-are particularly fond of that island, being, as they suppose, quite able to find upon it materiel sufficient for the erection of the largest possible " theories." Figures, it is said, can be made to prove either side of a cause ; so can stones. Each geologist can build up his own pet world from the same set of rocks; and so active geologists proceed to stucco over with their own compositions" adumbrate " a friend calls the process-the sublime works of the greatest of all designers. None of the sciences have given rise to so much controversy as the science of geology. I make no pretensions to much geologic knowledge, although I do know a little more than the man who wondered if the granite boulders which lie saw on a brae-side were oil their way up or down the hill, and argued that it was a moot point. What I would like to see would be a good work oil geology, divested entirely of the learned and scientific slang which usually makes such books entirely useless to ninety-nine out of every hundred persons who attempt to read them. I would like, moreover, a work that would not bully us with a ready-made theory. We had been lauded from the steamboat on a massive grey boulder, on the sides of which, thick as was the atmosphere, we observed dozens of limpets and crowds of "buckies," and other sea-ware, giving us token of ample employment when we could obtain leisure for a more minute survey of the rocks and stray stones which sprinkle the sea-beach of Corry. In the meantime, that is just after landing, the great, the momentous question on this and every other Saturday night is-Is the inn full q. A hurried scramble over the jagged stones, and a rush past the very picturesque residence of Mr. Douglas' pigs, brought us to the inn, and at once decided the question. Mrs. Jamison, the landlady, shook her lawn-bedizened head-the inn, alas, was full, overflowing in fact, for a gentleman had engaged the coach-house ! It was feared, too, that every house in the village was in a like predicament, and further inquiry soon confirmed this to us rather awful statement, and so I was left standing at the inn-door, with a bitingly shrewd companion, to solve this problem-Given the barest possible accommodation throughout all Corry for only forty-eight strangers, how to shake fifty into the village, so that each might have somewhere to lay his head ? This is a problem, I suspect, that few can answer. What was to be done ? The steamboat had gone !Were we then to tramp on to Brodick, with more than a suspicion of a rainy night in the moist atmosphere, or try a shake-down of clean straw in a lime quarry ? It might have come to that, and as both of us had before then camped out for a night by the sheltered side of a haystack, we might have arranged, fortified by the aid of a dram, or perhaps two, to pass a tolerable night in the lime cavern beside a very canny-looking horse-of-all-work that we caught a glimpse of through the gloom of the place while peeping into it. It fortunately occurred that a modest maiden lady, a very " civil-spoken " woman indeed, by name Grace Macalister, had been disappointed of two Glasgow gentlemen, who had engaged her whole house, and so the two benighted travellers from the east were accepted, at the instigation of the late Air. Douglas, a wellknown man in Corry, in lieu of them. Taking possession of our lodgings at once, we formed ourselves into a committee of supply, which resulted in a prompt expenditure of a sum of six shillings and threepence, the particulars of which, for the benefit of my readers, and to show how primitive we had all at once become, I beg to subjoin-namely, bread, 7d. ; mutton; 2s. 4d. ; butter, 62d. ; tea, 6d. ; sugar, 3d. ; milk, 2d. ; herring, 2d. This sum, with eighteenpence added for whisky, threepence for potatoes, and one penny for a candle, represented the total commissariat expenses of two persons in Corry for five wholesome but homely meals. Our bed cost us one shilling each per night, and our attendance and washing were charged at tile rate of a shilling a day, so long as we used the Hotel Macalister, but even this did not very much swell the grand total of the bill, which, at such rates, was by no means heavy at the end of our holiday ramble over Arran, especially when it is considered that the Arran season does not very greatly exceed one hundred days. Our quarters were certainly primitive enough--namely, half of a thatched cottage, or rather hut we may call it, consisting of one apartment containing two beds, four chairs, a small table, and a little cupboard. The beds were curtained by a series of blue striped cotton fragments of three different patterns of all old Scotch kind, and the walls were papered with five different kinds of paper ; but the low roof was the greatest treat of all-it was covered with old numbers of the Witness newspaper, at the time when it was edited by Hugh Miller, and these had, no doubt, been left in the cottage by previous travellers. The floor was covered with fragments of canvas laid down as a carpet. Many tourists would perhaps turn up their noses at this humble cottage, but to my friend and myself it was a delightful change. I have not space in which to particularise all the beauties of Arran, but I must say a word or two about Glen Sannox. Near the golden beach of Sannox Bay is situated the solitary churchyard of Corry, with its long grass waving rank over the graves, and its borders of fuchsias laden with brilliant blossoms. There was, we observed, on peeping over the wall, a new-made grave, that of an orphan girl who had been drowned while bathing. Passing the churchyard-there was once a church at the place, but all trace of it, save one stone built into the wall of the churchyard, has long passed away-we came upon a brawling stream, which led us up to the ruins of what had been a Barytesmill. The stones lay around in great masses, as if they had been suddenly undermined by the passing stream, and had fallen cemented as they stood. In a year or two they will be grown over with weeds, and in a century hence some persons may ingeniously speculate on the ruins, and give a learned disquisition as to the building that once stood there, and its uses. My friend and I wondered what it had been, but an old man told us all about it ; and strange to say, in the course of conversation, we found this old resident reciting scraps of Ossian's poems. He told us, too, that the bard had died in the very parish in which we were standing. He believed Ossian to have been a priest and teacher of the people, and this was an idea that was quite new to us. We had heard before, or rather read, that the poet was by some esteemed a great warrior, and by others a necromancer-perhaps to esteem him a teacher is right enough ; his poems, at any rate, were at one time as familiar in the mouths of the West Highlanders as household words. The scenery of Arran would certainly inspire a poet. As we penetrated into Glen Sannox it became most interesting, whether we noted the brawling and bubbling brook, or the rich carpet of heath and wild flowers upon which we trod. The luxuriance of its wild flowers is remarkable, and of its rabbits equally so. As we proceed up the glen, the lofty hills with their granitic scars frown down upon us, and one with a coroneted brow looks kingly among the others, as the mists float upon their shoulders, like a waving mantle, and with their bold and rugged precipices they seem as if they had just been suddenly shot out from the bosom of the earth. Glen Sannox is sublime indeed ; its magnitude is remarkable, and it is so hemmed in with hills as to look at once, even without any details, or the aid of history, a fitting hiding-place for the gallant Bruce and his devoted followers. About three miles north from this glen we can view-and, we venture to say, not without astonishment - the falling fragments of the broken mountain ; a stream of large stones that lie crowded on the declivity of the hill, till they in one long trail reach the ocean. But to enumerate a tithe even of the scenic and antiquarian beauties of the island would require-nay, it has obtained, and more than once-a volume. I could dwell upon the blue rock near Corry, and picture the overhanging cliffs of the neighbourhood mantled o'er with ivy. The visitor might enter some of the caves which have been scooped out by the sea, or wander among the rock pools of the indented shore, rich with treasures wherewith to feed the greedy eye of the naturalist, and view the ladies, with kilted coats, doing their daily lessons from Glaucus, collecting pretty shells, bottling anemones, or gathering sea-weeds wherewith to ornament their botanic albums. At last, after a long day's work of wandering and climbing, we long for a quiet seat and a refreshing cup of tea, and by and by, when the night shuts us out from active labour, we hie us to our box bed, in order to stretch our wearied limbs in Miss Macalister's well-lavendered sheets ; and, as we are just attempting to coax the balmy goddess to close our eyes with her soft fingers, we hear the landlady in her garret reading her nightly chapter from a Gaelic Bible, with that droning sound incidental to the West Highland voice. I have more than once after nightfall passed a quiet half-hour at our cottage door inhaling the saline breath of the mighty sea. The look-out at midnight is beautiful: the Cumbrae light looks like a monitor telling us that even at that dread hour we are watched over. On the opposite coast of Ayr a huge ironwork throws a lurid glare upon the bosom of the sea, and almost at my feet the restless waves play a mournful dirge on the boulder-crowded beach. I could see along the water to Holy Island, and almost feel the silence which at that moment would render the cave of old Saint Molio a wondrous place for holding a feast of the imagination, the viands brought forward from a far-back time, and the island being again peopled with the quaint races that had passed a brief span of life upon its shores-who had been warmed by the same sun as had that day shone upon me, and whose nights had been illumined by the moon now shimmering its soft radiance upon the liquid bosom of the glittering waters.